The bats are back, and they're ready to make music! A late-spring night sky fills with bats flocking to a theater already echoing and booming with delightful sounds of music. Bat music. Plunky banjos, bat-a-tat drums, improvised instruments, country ballads, and the sweet cries of a bat with the blues. 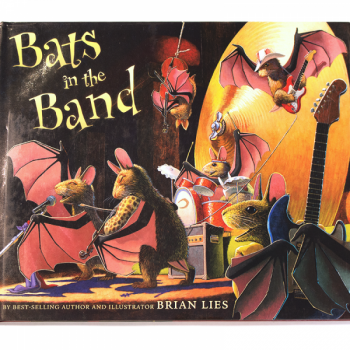 Join this one-of-a-kind music festival as the bats celebrate the rhythm of the night, and the positive power of music. Written and illustrated by Brian Lies. Other books in the series include Bats At The Beach, Bats At The Library and Bats At The Ballgame. All titles available here on Batgoods.com. Lies, who has ushered bats through a night at the library, the beach and the ballpark, invites a colony into a playhouse after lights out. There, he carves out a piece of the small hours for his readers, that strange time of collywobbles and spooky quiet. The playhouse is anything but, as the bats have decided to light up the dark with "a little night music." In tuneful couplets laced with fluid if demanding words like "sitar" and "improvise," the bats get busy with jazz--is that Dizzy, with those cheeks?--and rock--is that Leon Russell, in Uncle Sam's hat?--and a camellia-adorned bat woman with a broken heart: "Her feelings fill the room with blue," a room that Lies has draped with indigo. The paintings are full of mood and spot-lit color, the bats upside down and right-side up, the rhyme both casual and emotive. There is no doubt that Lies has made an effort to please adult readers with plenty of allusions: In what passes as their dusk, a bat takes his fiddle to the roof. But the bats never fly over young readers' heads. They are there to entertain, and that they do!